The Booth Brewing Samseong branch is located in between the towering offices of Gangnam and gives a wonderful sight of the city nightscape. The Booth is a craft beer specialty bar and offers a diverse range of beer with the highest quality. In particular, the Taegang Pale Ale is most popular and has been crafted in collaboration with world renowned beer manufacturing company, Mikkeller. 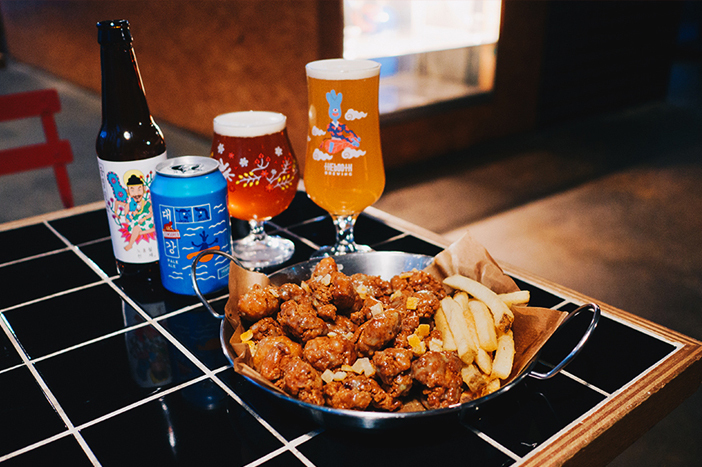 The night would not be complete without Korea’s favorite chimaek (chicken and beer) and pimaek (pizza and beer). ☞ Directions: Samseong Jungang Station (Seoul Subway Line 9), Exit 5. Walk approx. 5 min. On the streets of Itaewon, there is a large pink neon sign for Blue55. The dark interior is great, but the 3rd floor rooftop gives an excellent view of the Itaewon nightscape. The pink neon sign is a popular spot for social media posts. 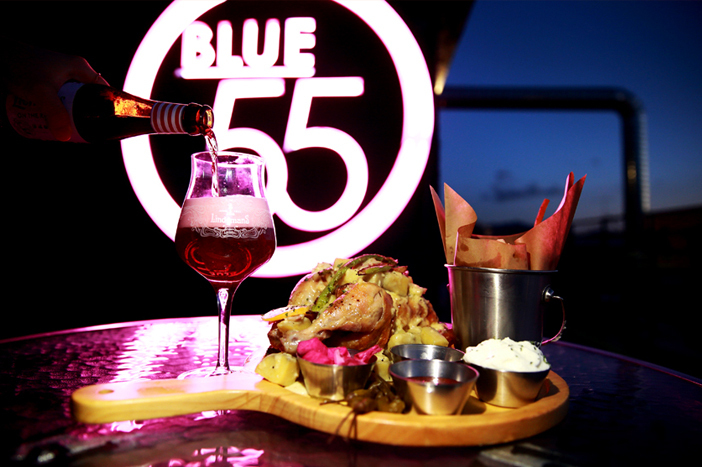 The signature dishes at Blue55 are the half pasta and sweet chicken. In particular, the sweet chicken with its deep creamy sauce and side of baked sweet potatoes, garlic, and asparagus make the perfect combination with beer. ☞ Directions: Itaewon Station (Seoul Subway Line 6), Exit 4. Walk approx. 3 min. Billy’s Table is decorated with artificial grass and cute light bulbs that give a picnic-like atmosphere. 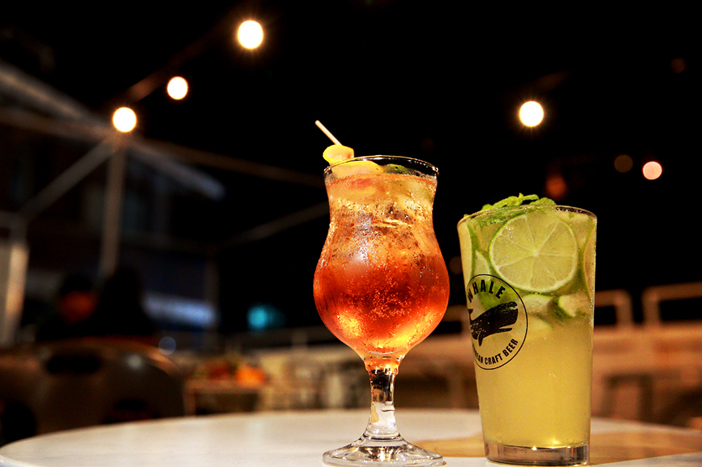 Enjoy the night at Itaewon with a glass of cocktail that has a low degree of alcohol and a dish of Gambas al Ajillo that has a savory olive oil scent. The dish tastes best when you place the garlic and shrimp on a warm piece of bread and dip it in olive oil. For a fulfilling meal, pasta and steak is available as well. ☞ Directions: Noksapyeong Station (Seoul Subway Line 6), Exit 2. Walk approx. 6 min. Just like its name, Universe Peace Project, the store has an artistic interior with a comedic touch. From the outside, the store looks very cozy and on the inside, it is decorated with various art pieces and adorable props. 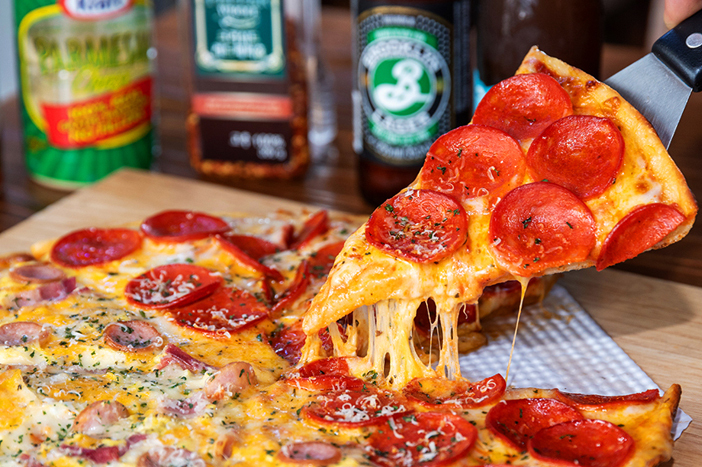 The most popular menu, UPP Pizza, is topped with sausages and bacon and goes great with beer. Also, there is a rooftop terrace where customers can take a glass of beer to sit back and relax while taking in the cool fall breeze of Itaewon. ☞ Directions: Itaewon Station (Seoul Subway Line 6), Exit 3. Walk approx. 15 min. Rooftop Floating is recommended for those looking for a romantic and luxurious atmosphere. To add to that, Namsan Tower and the Myeong-dong landscape can be seen through the high windows. Customers can also enjoy a glass of their favorite beverage and take in the view of the Seoul’s cityscape while receiving a foot spa. The staff recommends the Alada Gran Reserva Pinot Noir, a wine that is perfect for the autumn night. 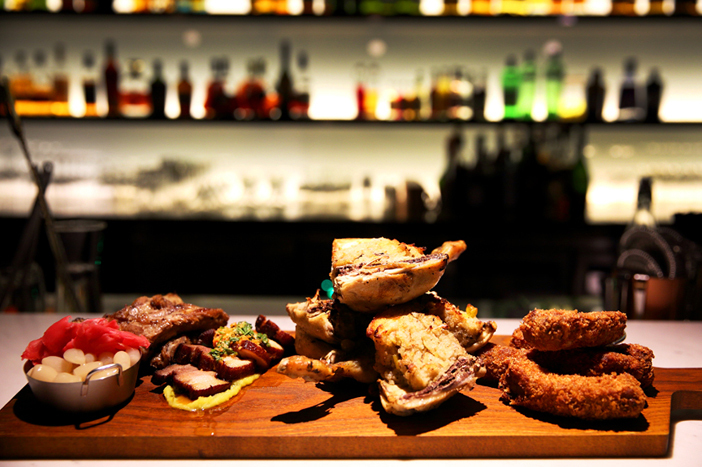 A dish that goes well with wine is their BBQ Platter, a platter of assorted barbeque that includes roasted chicken and rib katus. ☞ Directions: Myeong-dong Station (Seoul Subway Line 4), Exit 9. Walk approx. 1 min. * This column was last updated on September 2018, and therefore information may differ from what is presented here. We advise you to check details before visiting.